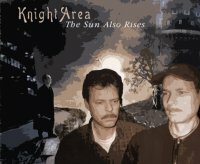 Knight Area is a Dutch project started by the two brothers Joop on flute and vocalist Gerben Klazinga who also plays keyboards and drums. The whole concept was originally concieved more than 20 years ago and has been in the making for that long. the album "The sun also rises" was ultimately composed and recorded during the last 3 years with the "cream of the crop" from the Dutch progressive rock scene. I will not even try to spell their names - but believe me, they are great. Knight Area uses a full sonic palette that will appeal to every lover of the more mellow and melodic sides to progressive rock music - like Pendragon and IQ for example. Mellotron/flute interplay, big Hammond organs, fluid synths and very well structured guitar solos. All wrapped in a highly dramatic scene of big vocals and lots of melodic fragments but with a good vibe and a breathtaking story behind it. In all this it is also important for me to mention the cover artwork - the whole product is like a big fairytale and Mattias Norén at Progart.com has done it again. He has made a marvellous cover with a lot of highly detailled bombastic drawings of a medieval scenery - with knights, castles, axes, swords and shields!. 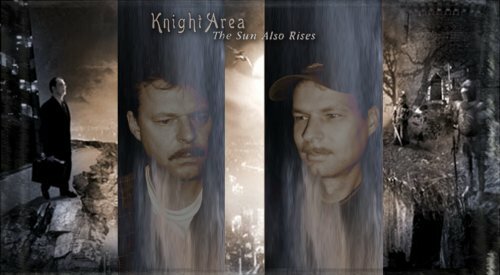 Q: You have just released a new CD under the Knight Area moniker called "The Sun Also Rises" and it got pretty good reviews all over the Internet Community - What is the story behind this project? 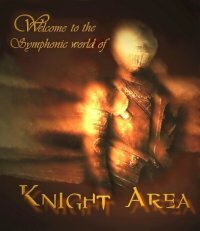 A: Knight Area is a symphonic project of the Dutch brothers Gerben and Joop Klazinga. I (Gerben) played for 10 years in de sympho band Sangamo. We recorded one mini album, which currently is a real collector item. After 10 years brother Joop advised me to start a solo project in order to convey my musical plans. I went to work and after a month Joop came to listen to the basic lines I created. He was very enthusiastic and decided to participate in the project. We started recording the music in 2000 and finished in 2003. I wrote most of the music, while Joop did most of the lyrics. I am a keyboard player and drummer; Joop plays the flute and some additional keyboards. For this project we hired 10 guest musicians to perform the other instruments like guitars, the accordion and of course the vocals. Q: The album "The Sun Also Rises" has been 20 years in the making - I can read in the following press material - how come? A: Well, that’s not entirely true. There were two songs from 1985, which we wrote in the parental house (‘The Gate…’ and ‘Saevis…’). We still have the original tapes of these tracks in which we played all the instruments by ourselves. In the year 2000 we modified the songs and Joop wrote a nice lyric for ‘The Gate’. The other songs were written in 2000/2001. Of course, ‘The Sun…’ is our debut album, and so it can be regard as a harvest process of 20 years prog/sympho experience. Q: Can you describe the work process doing this very complex new album? How did it start? How did you get the musicians to participate? Many musicians used on your album are the cream of the crop on the Dutch prog scene? A: It’s very easy when you have your own studio, so I could work on the project in every spare hour. First of all I recorded the drums and the keyboards; guitars and bass came out of the computer. Later on I asked the other musicians to participate (they are all friends of mine) and play the parts I did on the computer. They all are very skilled musicians however there are only two guys that have a certain name in the prog scene; Gijs Koopman and Rinie Huygen played in the band Cliffhanger. They were quite successful in the end of the former century. Q: How do you see the CD's chance on a very complex market of today? To me "The Sun Also Rises" is a milestone in the melodic progressive genre - and I’m normally into more straight rock things - but this one is really great. A: Well Steen, that’s a great compliment; we often receive flattering remarks on our album from metal websites en magazines. We have a great record company in The Laser’s Edge and the Danish promotion company Intromental is doing its best to promote our album all over the world. So, that’s why I expect our album will have a broad market. The album is not in general soft sympho you know; there are really metal or gothic like guitar riffs on it! Q: What are your main influences in music? I'm as mentioned not a hard-core connoisseur of prog-rock, but I can hear extracts from Genesis, Pendragon and IQ - how did you start up in the first place? Q: The progressive genre as well the more melodic genres has suffered from less attention the last 5 years, but I think I can sense a certain optimism nowadays with new record companies, lots of websites, and lots of discussion groups on the Internet - how do you see the genre? And do you think the Internet is a help to promote your genre in general? Q: How about yourself? What are you up to these days? And how about a tour in the future for Knight Area! A: A few weeks ago we formed the band that’s going the play our music live. Because our music is pretty complex, we are working with two keyboard players and two guitarists. So if there are bands needing a support act or festivals and booking agencies, please contact us on Info@knightarea.com. On our website you can read more about the band. We are very busy doing interviews all over the world. For instance, last week Joop did an interview for an American radio show in the middle of the night. O.k. it’s all fun, but also very demanding, considering we both have our regular jobs (playing prog does not make you rich; we play it because we love it). Thanks for having us on your website Steen! Q: Thanks for your time. 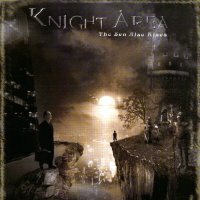 I hope that Knight Area will have a bright reception in the Worldwide CD-market - good luck!